Treatment demand for amphetamine rose between 2006 and 2014; in 2015 it remained the same. 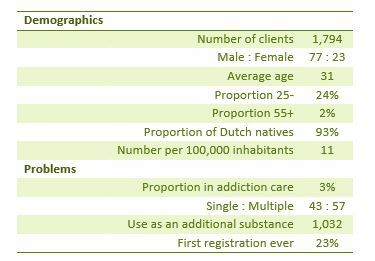 The increase is mainly attributed to clients who were previously in treatment; the influx of newcomers is stable. The percentage of young people has declined in the past 10 years; the average age is rising. In 2015, the number of people requesting treatment has remained virtually the same compared with 2014. This is contrary to the trend of the overall decline of 7% in the entire addiction care. There are relatively many people requesting treatment who indicate having problems with other drugs in addition to amphetamine. Almost 60% have multiple problems.